Wow, Doctor is really on a winning streak lately. After the awesome first two episodes, the lesser but still good third episode and the brilliant fourth episode, the fifth episode; Time Heist, was perhaps the best yet. 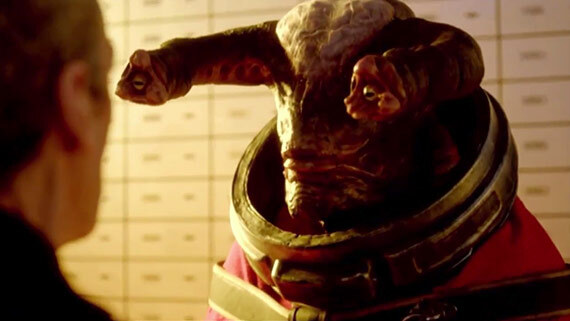 It may not reach the emotional highs of Listen or the inspired direction of the first two episodes, but Time Heist was perhaps the episode that did the most things right. From a great script, brilliant prosthetics and creative direction, I think Time Heist will down as a high point in an already great season. The episode started with Clara preparing to go on a date with Danny, when the Doctor interrupts. This conflict between her two lives seems like a focal point in next weeks episode but for now we don’t focus on it. The Doctor suddenly gets a phone call on the mysterious TARDIS phone and we suddenly cut to the Doctor and Clara sat in a weird room, their memories have been erased by Shivers-esque worm things and they are told to rob a bank. Cue intro. These sort of mysterious openings are always good, and the answers to the reasons behind the groups memory loss aren’t revealed to the very end meaning we are intrigued throughout the entire episode. The two temporary companions this time are unique as well, with half man half cyborg Cypher a particular highlight. It was nice seeing this side of the future, and a bit of cyberpunk never goes a miss. Similarly the glimpses of a strange Western/Eastern mash up future was also cool, reminding me of Blade Runner or Firefly.Perhaps the real stand out character this episode though was The Teller, an alien creature who was used to read minds and sniff out guilt. The Teller seemed to be a combination of prosthetics and animatronics and was some of best not just on Doctor Who but TV as a whole, it was seriously impressive. And without spoiling it, he was perhaps the most important part of the episode. 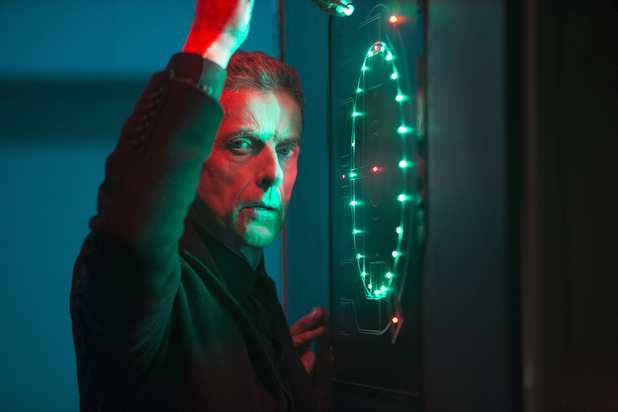 Capaldi continues to be a great Doctor and is becoming increasingly comfortable in the role balancing the dark aspects of the character along with the light ones. Ashes to Ashes’ Keeley Hawes is great as the villain, if a little one note, but great none the less. Jenna Louise Coleman as Clara is perhaps the real shock of the episode and the series as a whole though. As someone who didn’t like her character in the last series, she’s really improved into a fully fleshed out character rather than a plot device. The episode was also very well directed, which seems to be a consistent point in this series. Director Douglas Mackinnon did a great job last week in the atmospheric Listen and did a equally great job this week; making Time Heist feel more like a homage to modern heist movies such as the Oceans films and the Mission Impossible films rather than a direct parody of them. The obvious reuse of sets that was apparent in previous episodes was offset here with some unique lighting and interesting camera work and the special effects were on par with the best episodes. Overall Time Heist was a solid, creative and unique episode in the already brilliant series. Full of great lines, great performances and some top notch direction it once again showed that whatever the genre, Doctor Who can do it. Perhaps the standalone-ness and lack of overall recurring plot lines (such as the mysterious Missy) will make the episode unfortunately forgotten, but hopefully it will be remembered as a extremely fun and different, well made episode.